The PCE-DE 25N enables optic insights of the interiors of machines and facilities. 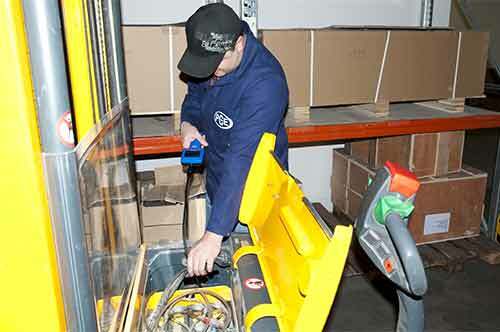 The endoscope is the ideal tool for maintenance in industries and workshops. An optic analysis via endoscope has never been this easy. The cable is to be pushed through the drilled hole or a cavity near the area which you want to check. The image is shown on a display. Due to its flexible handling, light weight and excellent view, this endoscope enables an easy and early detection of weak points. Thus, specific actions can be taken without further dismantling of the machinery. This endoscope covers a vast field of utility due to the length of the flexible part and a small calibre of 10 mm. 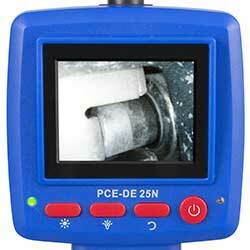 Reduce your amount of work by using our endoscope PCE-DE 25N for inspections and attendance of your machines and engines to save time and expenses for dismantling the machines. 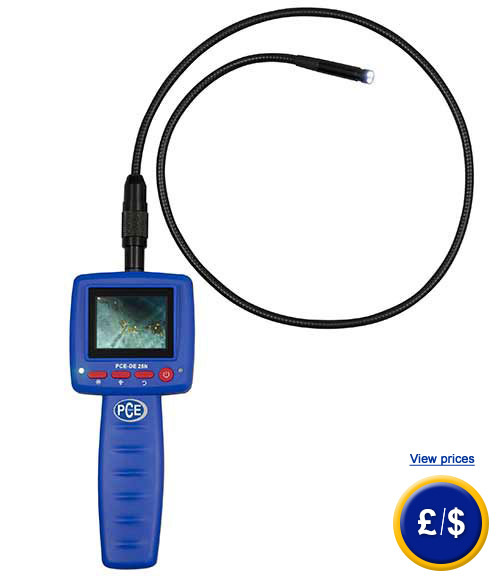 An overview of the endoscopes purchasable in our shop can be found below. 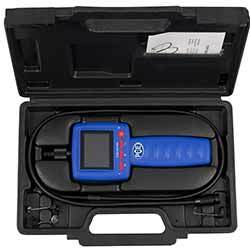 We would like to point out some of our most popular products for inspection and attendance: stroboscope, thermographic camera, tachometer, power meter. In case that you should have more questions regarding the PCE-DE 25N Endoscope, please read the following technical data, use our contact form or call us: UK customers +44(0) 23 809 870 30 / US customers +1-410-387-7703. Our technicians and engineers will gladly advise you regarding the Endoscope or all other products in the field of Control Systems, Laboratory Equipment, Measuring Instruments or Scales and Balances of PCE Instruments Ltd. In the pictures below, you can see the endoscope in use. The areas of application are nearly limitless. As such, the endoscope is being used by electricians, experts on security and expert witnesses in every branch, in mechatronics, in areas of precision engineering, by maintenance personnel in vast industrial manufacturing processes, by pump mechanics and auto mechanics as well as in areas of private use. Thus, the endoscope saves a lot of time and money. Another useful operation field for the endoscope is in training situations. The endoscope is useful equipment in areas of industry, school and college for demonstrations. The endoscope is not designed for medical use! The following picture shows the head of the endoscope PCE-DE 25N with a calibre of 10 mm, and a camera lense in the middle, which has a resolution of 240 x 230 Pixel. The 4 LEDs are arranged around the lense and are dimmable, resulting in an optimized lightning of dark holes and cavities. The groove at the back of the head holds various attachments (magnetic adapter, hook adapter and mirror adapter). By means of the attachments, the Endoscope PCE-DE 25N becomes a multifunctional device. The following list offers a view into the various possible areas of operation for and additional functions of these attachments. 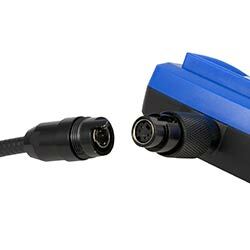 With this hook adapter, the endoscope can be used to remove objects from places that are difficult to reach. It is suitable for any object that can be gripped by the hook (e.g. : sealing ring, nut, cable…). If a metallic object is stuck in a narrow enclosure, for example the enclosure of gears or machinery, it can be found with this endoscope and pulled out via the magnetic adapter. By means of the mirror adaptor, even unclear spaces that are usually not reachable with a common endoscope can be seen, e.g. the back of objects that are difficult to approach. Usually, these functions are only accomplishable with the help of significantly more expensive endoscopes with a complex rotary head technology. In 1806 a German doctor named Philipp Bozzini developed the endoscope for the purpose of medical diagnosis. The first prototypes were stiff and worked with a candle. Over time, the endoscope underwent many developments and became necessary equipment in various areas. It remains basic equipment in areas of medicine, where it is not only used for examinations but has also, by means of incorporated channels, become a multifunctional tool for surgeries in areas that are usually difficult to reach. Another very important area of application is in technical fields, e.g. 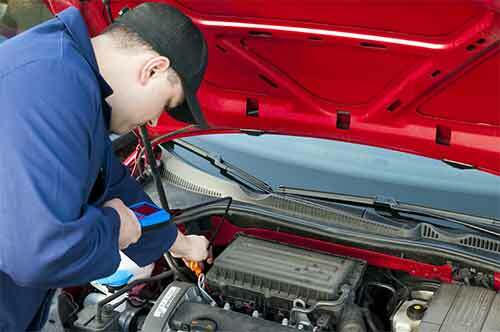 in the automobile industry to check motor engines, in sanitarian fields to examine drains, in areas of preservation of structures to check buildings for pest infestations. In all these areas the endoscope is indispensable equipment. The endoscope became so popular due to the various types available on today’s market. The two basic types are the flexible and the stiff endoscope. In the following, you can see more products in the field of "endoscope"
Attention: The endoscopes purchasable in our shop are not designed for use in areas of medicine. They are only customized for operation in areas of industry, crafting, trade, institutional research and development or for private use.